Magnelis® is an exceptional metallic coating which provides a breakthrough in corrosion protection and is the best choice for a wide variety of applications. Thanks to its unique composition, Magnelis® provides an unprecedented level of surface and cut-edge protection, even in the most hostile environments. It is produced on a classic hot dip galvanising line which molten bath has a unique chemical composition including zinc, 3.5% aluminium, and 3% magnesium. 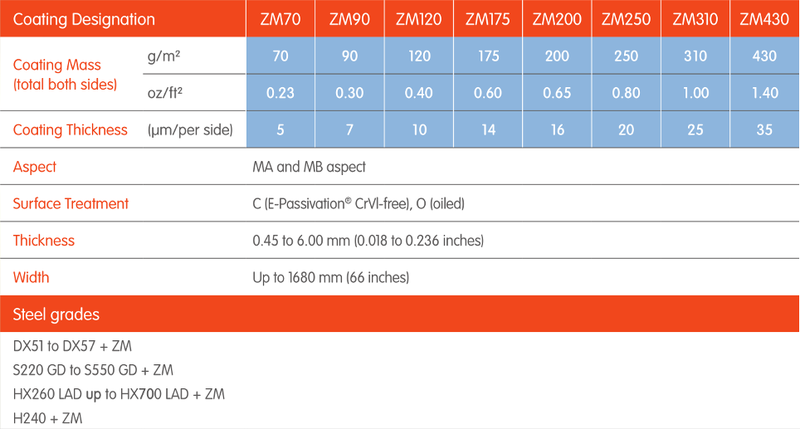 Up to 25 years guarantees with Magnelis® ZM310 on different applications. Contact us for more information. Magnelis® is produced in Belgium, Germany and Spain and distributed as slitted coils or sheets through the ArcelorMittal distribution network in Europe. Magnelis® can be applied on a very wide range of steel grades. These include steels for cold forming and deep drawing applications, as well as structural and high strength, low alloy steels. Steel thickness can range from 0.45 to 6 mm, while the coating can be from 5 to 35 μm/per side (ZM430). Let’s build your solution together! ArcelorMittal is offering an innovative co-engineering approach to its customers in order to optimise the use of Magnelis® and to achieve the best possible results and cost reduction.